Also serving communities of Clear Lake, Lake Mills, Hampton. The average cost of assisted living in Mason City is $3,895 per month. This is higher than the national median of $3,345. To help you with your search, browse the 7 reviews below for assisted living facilities in Mason City. On average, consumers rate assisted living in Mason City 4.3 out of 5 stars. Better rated regions include Albert Lea with an average rating of 5.0 out of 5 stars. Caring.com has helped thousands of families find high-quality senior care. To speak with one of our Family Advisors about assisted living options and costs in Mason City, call (855) 863-8283. Mason City, Iowa has a population of 27,546 and residents' average age is 42.6. There are five assisted living facilities in the Mason City area, with three in the city proper and two more nearby. Residents in assisted living communities receive assistance with activities of daily living and medication management. ALFs do not provide nursing-home level care. In Mason City assisted living communities, as in the rest of the state, ALFs are monitored and inspected by the Iowa Department of Health Facilities. Oversight includes specific security requirements, caretaker training and investigation of improper care of the residents. The cost of living in Mason City is 20.30 percent lower than the national average, an important consideration for seniors on a budget. Winters in Mason City can be very cold, with temperatures averaging in the 20s and plenty of snow. Those at risk of falls should use caution when venturing outdoors. Summers are warm, with regular rainfall, and spring and fall are mild, supporting outdoor activity much of the year. Tornadoes are a risk in the spring. The Mason City area is home to world-class medical facilities, including Mercy Medical Center and the VA of Central Iowa, in the event of medical emergencies or illness. Mason City has an array of community resources for seniors, including the Mason City Senior Activity Center, an organization that offers low-cost meals, planned activities and even a billiards room. Crime rates in Mason City are higher than the national average. Violent crime rates in the area are slightly more likely than in the rest of the country, and the property crime rates are around 14 points higher than the national average. Seniors may want to consider the security of any prospective ALF when moving to the area. Mason City is moderately tax-friendly for seniors. Social Security benefits are exempt from the Iowa state income tax. Other forms of retirement income are taxed, but seniors are eligible for a deduction of up to $6,000 on that income. Assisted Living costs in Mason City start around $3,895 per month on average, while the nationwide average cost of assisted living is $4,000 per month, according to the latest figures from Genworth’s Cost of Care Survey. It’s important to note that assisted living rates in Mason City and the surrounding suburbs can vary widely based on factors such as location, the level of care needed, apartment size and the types of amenities offered at each community. 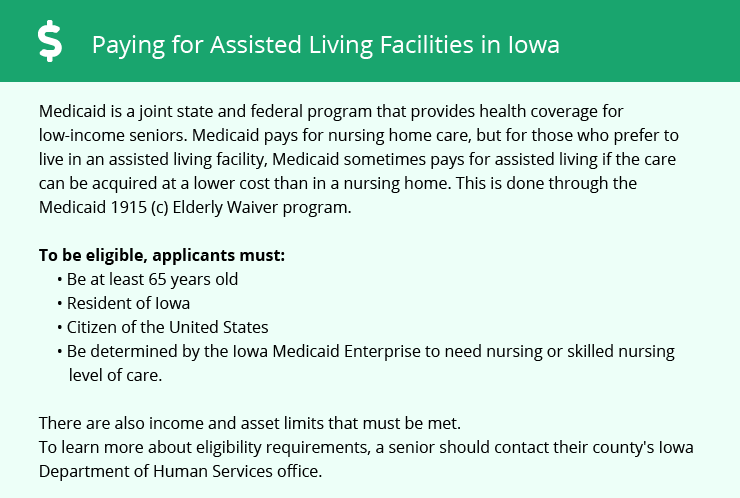 Seniors in Mason City may apply for a Medicaid Waiver to help offset the cost of assisted living. Seniors may also be eligible for a bridge loan to help offset the cost of transitioning into an assisted living facility. Veterans may also have options for financial aid, as may those on Social Security income. Mason City and the surrounding area are home to numerous government agencies and non-profit organizations offering help for seniors searching for or currently residing in an assisted living community. These organizations can also provide assistance in a number of other eldercare services such as geriatric care management, elder law advice, estate planning, finding home care and health and wellness programs. To see a list of free assisted living resources in Mason City, please visit our Assisted Living in Iowa page. Mason City-area assisted living communities must adhere to the comprehensive set of state laws and regulations that all assisted living communities in Iowa are required to follow. Visit our Assisted Living in Iowa page for more information about these laws.